On May 21, 1971, Motown Records released an album unique to its vast, already classic catalog: a suite of protest songs, railing, albeit softly and with an undeniable groove, about the planet’s woes and the pain of war. With What’s Going On, Marvin Gaye forever changed the sound and subject matter of popular music, influencing and inspiring every generation since. Formerly Motown’s reigning smooth-faced, smiling, mass-appeal artist, this album was Gaye’s departure for the bearded, brooding, reflective, angry artist he would become. His first self-production, the album was written, sung and solely produced by Gaye. Forty years on, the album remains a timeless classic. Speaking boldly and passionately about social issues on the street unlike any other album before, What’s Going On provided a soundtrack to life in America—and still does. It was a smash from the start and it’s still one of Rolling Stone magazine’s top ten Greatest Albums of All Time. Two songs from this album are in the Grammy® Hall of Fame, which honors the most important recordings in history. In celebration of the 40th anniversary, Motown/UMe proudly announces the release of What’s Going On – Super Deluxe Edition, on May 31, 2011. This new Super Deluxe Edition includes two CDs and one vinyl LP, 14 unreleased tracks, copious rarities, all complemented by an oversized booklet with two essays and rare photos from the original cover shoot. Inside as well is a reproduction of the album graphics, which showcased, for the first time at Motown, the song’s lyrics—and identified the musicians. Leading off this lovingly produced, double-gatefold 12×12 package is a newly remastered version of the original album, which delivers a deeper, warmer sound than in previous reissues. Added to the album on Disc 1 are several outtakes from sessions that led up to the recording of the LP—the original mix of the title song Marvin presented to Motown’s legendary Quality Control meeting, where it was summarily rejected; and song demos which show Marvin wrestling with the rejection—as well as the album’s three mono single releases, each of which reached No. 1 R&B and Top 10 pop: “What’s Going On” (in a very different mix than the LP), “Mercy Mercy Me (The Ecology)” and “Inner City Blues (Make Me Wanna Holler),” plus their B-sides, of which two are alternate takes from the familiar LP versions. 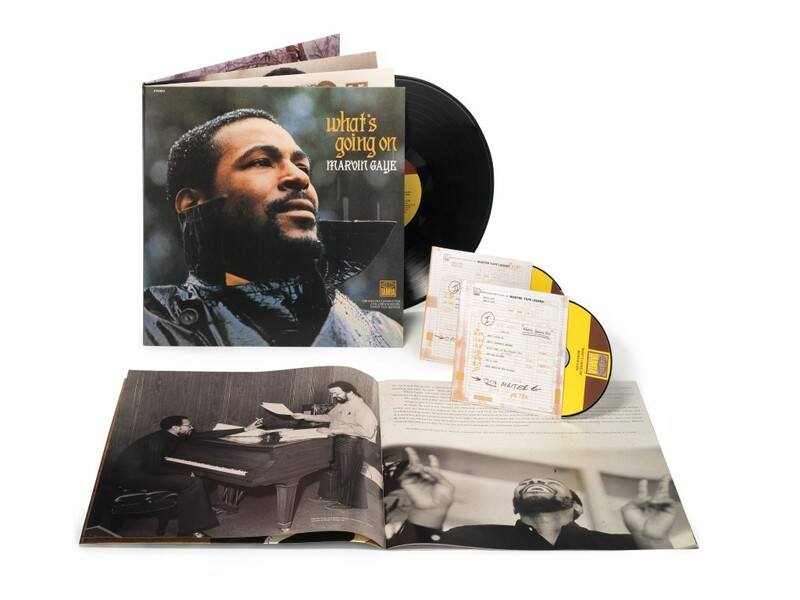 Disc 2 of What’s Going On – Super Deluxe Edition is a document of the album’s aftermath, when Marvin Gaye, reluctant to tour and shy about becoming the “spokesman of his generation,” holed up in Motown’s Studio B in Detroit with like-minded musicians—among them the young guitarists Ray Parker Jr. and Wah Wah Watson, and the 20-year-old bassist Michael Henderson, fresh from a Miles Davis tour—and simply jammed over several days. These tracks, mostly instrumental, are as brooding and funky as the What’s Going On album cover. The rest of the disc includes Gaye’s final sessions in Detroit; among the few tunes he recorded was a sequel of sorts to the album, the politically tinged non-LP single “You’re The Man,” which hit the R&B top 10 in spring 1972. Also included are two rare alternate takes of the song. Capping this special release is the first ever 12-inch vinyl LP of the “Detroit Mix” of What’s Going On, the original, darker mix of the entire album, left behind when Gaye decided to finish the overdubs in Los Angeles. Inside is an LP-sized booklet with rare photos from the sessions, the original lyrics, detailed recording annotations and two essays: one by Gaye biographer David Ritz describing the “Why” Marvin Gaye created his first-ever self-produced album, and another detailing the “How” by Ben Edmonds, author of What’s Going On: Marvin Gaye and The Last Days Of The Motown Sound. The anniversary will also be marked on stage this summer when Rickey Minor, Stevie Wonder and Friends (including special guest Janelle Monáe) perform a July 24 Hollywood Bowl concert concluding with a tribute to What’s Going On. In May of next year, at the Kennedy Center in Washington, DC, the National Symphony Orchestra with John Legend and The Roots will collaborate for a special What’s Going On concert to note the 40th anniversary of Gaye’s legendary performance at that venue.